The composition of isotopes of the noble gas xenon in the primordial composition, known as U-xenon, that scientists think was present in the early atmosphere of Earth (shown as blue data points and line). 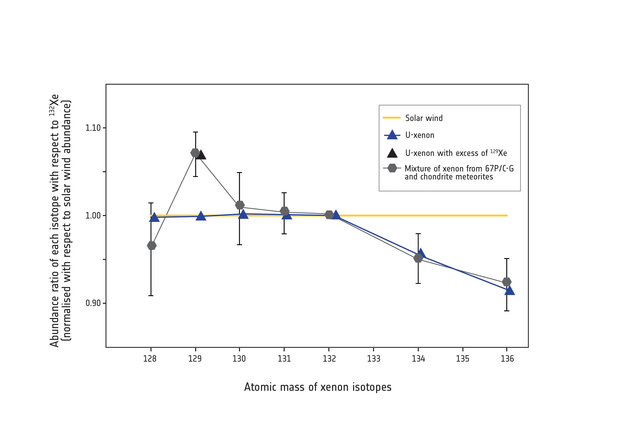 This U-xenon contained a similar mix of light isotopes to that of the solar wind (yellow line), but included significantly smaller amounts of the heavier isotopes. The blend of xenon detected by ESA's Rosetta mission at Comet 67P/Churyumov-Gerasimenko seems to be closer to U-xenon than to the average composition found in the solar wind. This is the first discovery of a candidate for the hypothesised U-xenon. Scientists think that the primordial xenon delivered to our planet could derive from a combination of impacting comets and asteroids (grey data points and line), to which comets contributed about 22 percent. This combination also takes into account the excess of one particular isotope of xenon, 129Xe, which is observed in Earth's atmosphere (black data point). Rosetta's measurements of xenon at Comet 67P/C-G suggest that comets contributed about one fifth the amount of xenon in Earth's ancient atmosphere. They also indicate that the protosolar cloud from which the Sun, planets, and small bodies were born was a rather inhomogeneous place in terms of its chemical composition.